Where do Martin, Tulowitzki fit with Jays' youth movement? Here is what he meant. With John Gibbons likely on his way out at the end of the season, he’s doing the bidding of the front office when it comes to September playing time. The front office has dictated that the kids get the at-bats to see what they can do. Martin’s playing time has obviously suffered. He understands why he isn’t playing, but obviously doesn’t like it. 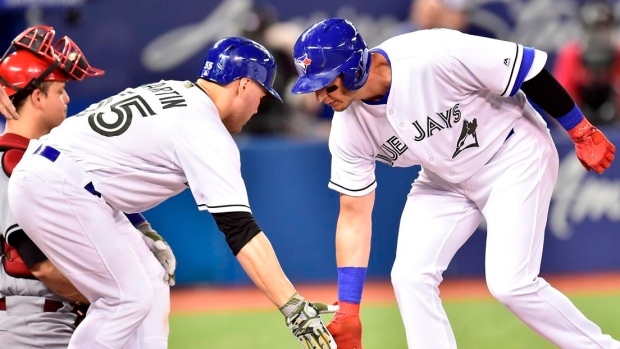 The Jays are in a bit of a predicament with their two veteran leaders, Martin and Troy Tulowitzki. They’re getting up in age and have physically had some challenges over the past couple of years. Martin dealt with neck irritation and a strained oblique last season and isn’t nearly the player he once was. Tulowitzki seriously injured his ankle in July of 2017 and couldn’t return to the field. This spring, he dealt with bone spurs in his heels that ultimately cost him his season. He had surgery and has acknowledged that he may not ever be pain free again. Each player will make $20 million next season while Tulowitzki is also contracted to make $14 million in 2020. He has an option for 2021 as well, with a $4 million buyout. The fact is that neither Martin nor Tulowitzki can predictably be everyday players again. Their performance has declined and Father Time is catching up. The reality is that the plan moving forward has to consider them as semi-regular or role players, despite their contracts. The plan can change if they show reclamation in health or performance, but that seems unlikely. The organization is looking to pass the torch to Danny Jansen behind the plate and Lourdes Gurriel Jr. at shortstop. Martin and Tulowitzki are part of the past and these kids are part of the future. And both veterans’ contracts are unmovable. Nobody wants them because their performance doesn’t come close to their salaries. The transition of a team can be painful because players that the organization respects lose playing time and can feel underappreciated. It’s inevitable and the players are always the last to know they can’t do it anymore. Martin seems to be moving to a place of acceptance, as he’s only caught 71 games played third base in 21 games, shortstop in three games and left field in one game. And he’ll likely do more of the same next season. Tulowitzki said he welcomes competition and if he isn’t good enough to be the starter then he would be willing to go home. I’m not sure he meant that he would walk away from the $38 million left on his deal, but his proclamation will likely get tested. One possible scenario that could benefit both Tulowitzki and the Jays is if he is at some point deemed physically unable to perform and the Jays can collect disability insurance on his contract while he still gets paid. The decision to diminish an aging veteran’s playing time is much easier when the player’s contract wasn’t your commitment. Mark Shapiro and Ross Atkins inherited Martin and Tulowitzki, so it’s easier for them to play kids and not get a return on the big contracts. They can explain to ownership that they are cleaning up the decisions made by Alex Anthopoulos. The award races this year are as competitive as I can recall. There are so many great players who are so closely matched in their numbers. And the AL Rookie of the Year Award is going to be compelling. Certainly, Shohei Ohtani made an extraordinary impact as a two-way player. As a pitcher, he’s 4-2 with a 3.31 ERA in 10 games. But his pitching was cut short by an elbow injury that degraded during the season and may now need Tommy John surgery. Offensively, he was a pleasant surprise after a tough spring training where he really struggled swinging the bat. He made the necessary adjustments and hit .292/. 374/.583 with 20 homers and 20 doubles. He also drove in 55 runs and scored 53, along with nine-of-13 on stolen bases. Ohtani’s closest competition for the AL ROY award are Yankees Miguel Andujar and Gleyber Torres. Andujar is the first rookie who has played more than half his games at third base who has delivered at least 40 doubles and 25 homers. He has hit .298/.331/.524 with 84 RBI and 78 runs scored. Torres has hit .280/.347/.494 with 23 homers, 71 RBI and 50 runs scored. Andujar has been the better hitter but his defense at times has struggled. Torres plays the tougher position and deserves some credit for that. Both Yankees have had Rookie of the year caliber seasons and may steal votes from each other. Ohtani is my winner because he is an elite level pitcher and an elite level offensive player. He had tremendous pressure coming to Los Angeles from Japan and handled it extremely well. And he delivered big numbers while working around a significant injury. MLB.com took a poll of Baseball Writers this past week on the AL Cy Young Award and Red Sox starter Chris Sale edged out Blake Snell of the Tampa Bay Rays. I’m hoping the writers will come to their senses between now and the end of the season. Chris Sale (12-4, 1.92 ERA) has had a great season but he has been nagged by shoulder issues and has only thrown 9 innings since July 27. He has thrown a total of 150 innings on the year. In order to qualify for the league leaders a pitcher needs to accumulate at least 162 innings. It is unlikely in his next two starts that Sale will add the 12 innings he needs to get there. Whereas, there is not an innings pitched total as a requirement to win the Cy Young Award, since closers have won in the past, it does seem that it would be necessary for a starting pitcher to at least get to that level. Blake Snell (20-5) has thrown 169 innings and will likely get to 180 innings pitched before the end of the season. His 1.97 ERA is the best among AL qualifiers. He has the second-best WHIP and lowest opponents’ batting average as well. Sale and Snell are 1-2 in Wins Above Replacement. Snell should win the award in the AL. The Cleveland Indians could be a scary team in the playoffs because they have deep starting pitching, a balanced and powerful bullpen, solid defence and a potent offence. But if they’re going to win the World Series they are going to have to do something in October that they haven’t done all year - beat teams with a record over .500. The Tribe is only 21-30 in games against baseball’s better teams. The Yankees are going to have to make a tough decision about who to start against the Oakland A’s in the Wild Card game. It will be either J.A. Happ, (6-0 with a 2.39 ERA in nine starts since joining the Yankees), or Masahiro Tanaka (with a 2.39 ERA since coming off the DL on July 10). The Yanks currently hold a 1 1/2 game lead for home field advantage. So if the game is at Yankee Stadium they may want to start Happ to neutralize the short-porch in right field. Also, the Athletics are just 30-25 against left-handers and 60-36 against right-handers. If the game ends up in Oakland, then Tanaka may be the better choice as he is 7-0 with a 3.31 ERA on the road. The winner of the Wild Card game in the AL plays a Red Sox team that are not nearly as good against left-handers either, as they went just 21-15 versus going 82-33 against righties. I would be inclined to roll the dice with Tanaka against the A’s and hold Happ for two starts against the Red Sox. The National League has clinched a winning record in interleague play this season for the first time in 14 years. It is only the fifth time since its inception in 1997 that the senior circuit has prevailed. The AL leads the matchup at 17-5 and has dominated over the years because of the designated hitter. When the clubs match up, the NL usually uses a role player in the role of DH in the AL parks while the AL teams all have a specific big bat in that role. The reason why the NL had a winning record this year is because the American League is more top heavy while the NL has more depth of competitive teams. Ten of the 15 NL teams had winning records, including all five clubs in the NL Central. This year it was East vs. East, Central vs. Central and West vs. West. The AL has seven teams that either collapsed or are rebuilding, while the NL only has three. The NL Central is the deepest division in baseball and all five teams had winning records against the AL Central which is the weakest division in baseball. In fact, the NL Central is 56-35 over their counterpart in interleague play. The NL West and AL West split 50-50 while the AL East beat the NL East 54-46. The Red Sox have the best interleague record in baseball at 16-4 while the Pirates are the second best at 15-5. Just when you think you’ve seen everything, something happens to remind you what a great sport baseball is. This week, Brewers outfielder Christian Yelich became just the fifth player ever to hit for the cycle twice in a season and the only one to do it twice against the same team (Reds). Two starts ago, Stephen Strasburg threw a pitch that hit a batter (Jesus Alfaro-Phillies), catcher (Matt Wieters) and an umpire (Brian Knight). That’s not easy to do. In fact, I’ve never seen it happen before. Amazingly, he did it again last start when he hit the Marlins’ Brian Anderson, Wieters again and umpire Hunter Wendelstedt. On Saturday, the Marlins and Phillies combined to use 15 pitchers, none of whom took an at bat at the plate. It was the first time ever since 1900 in a non-designated hitter game that no pitcher took a single at bat (courtesy of Elias Sports Bureau). And only the fourth nine-inning game in which no pitcher recorded more than six outs (Elias Sports Bureau). The Boston Red Sox had a banner printed celebrating their division title this season. The only problem is that they haven’t clinched the division. You would think they would have learned about assuming something like that. In 1986, they brought champagne in the clubhouse prior to the ninth inning of Game 6 of the World Series at Shea Stadium. Then Mookie Wilson hit the grounder through Bill Buckner’s legs and you know the rest. Their black cat moment. When I was Mets general manager I called down during our playoff series clinchers and always made sure the champagne was never brought into the clubhouse before the game was over. I told my clubhouse manager I would fire him if there were any TV shots of the champagne being set up before the game ended. I’m not superstitious, but I just never wanted to mess with them. Final note on the Red Sox: That 2018 AL East Division Title banner fell out of the back of a truck in Sommerville, MA. That’s very close to Tufts University, nicknamed the Jumbos. So if the Red Sox fold and don’t win the AL East, just call it the curse of the Jumbos.